(1 Customer Reviews) | Write Review 6 issues per year Your spotlight on drama education. 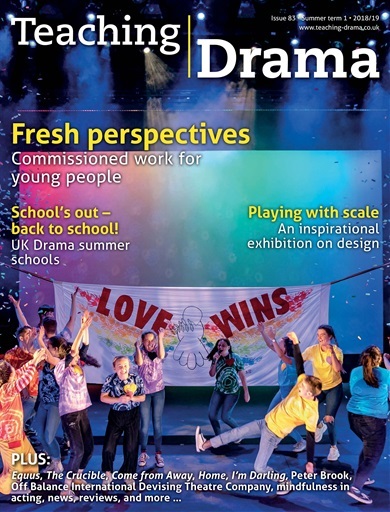 Teaching Drama magazine is the ultimate resource for any theatre practitioner or teacher, offering features, practical advice and tips, lesson material, product and performance reviews, news and more. • Reviews of the latest books, play texts and productions. 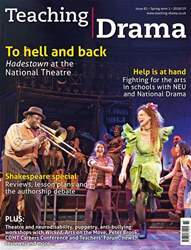 • Theatre and education news and features, offering advice and ideas from key teachers, playwrights and practitioners. • Convenient listings of forthcoming teacher and student workshops and courses. • Free monthly e-bulletins with breaking news and competitions. • Unlimited access to our online schemes of work when you upgrade to Teaching Drama Online. Looking for Teaching Drama in print? Unfortunately pocketmags.com does not sell print copies of Teaching Drama, but all is not lost. Our partner at magazine.co.uk sells print subscriptions at the best prices online. TD meets the theatre companies commissioning new plays for the next generation; the National Theatre’s ‘Playing with Scale’ exhibition explores set design and model boxes; and our round-up of this year’s summer schools available to young people at many of the finest drama schools and conservatoires. Plus, The Yard’s female-led production of The Crucible; director Ned Bennett discusses character, style and innovation in English Touring Theatre’s staging of A Level set text Equus; alternative methods of drama assessment and how to use technology to allow learners to express their understanding; listening to a character’s inner thoughts using thought-tracking; practical strategies inspired by Off Balance International Devising Company; the University of Wolverhampton’s BA in Music Theatre; part two of our look at theatre practitioner Peter Brook; and is technology and the digital age a good thing for drama teaching? Your spotlight on drama education. 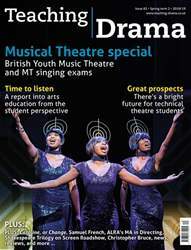 Teaching Drama magazine is the ultimate resource for any theatre practitioner or teacher, offering features, practical advice and tips, lesson material, product and performance reviews, news and more. You'll receive 6 issues during a 1 year Teaching Drama magazine subscription. You'll receive 6 issues during a 1 year Teaching Drama magazine print subscription.